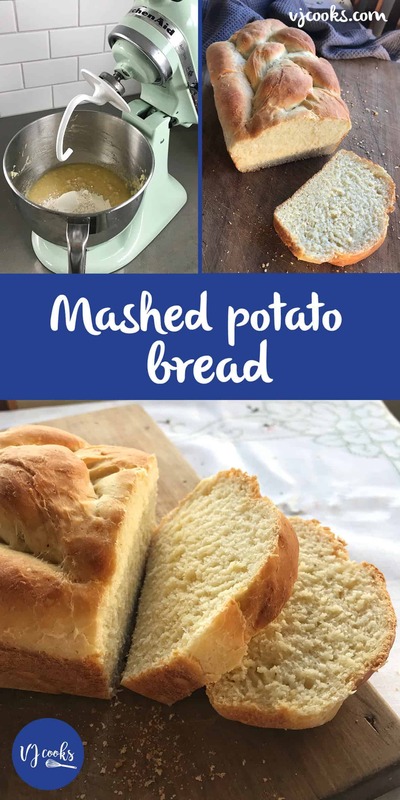 This mashed potato bread is delicious and a great way to use up leftovers. 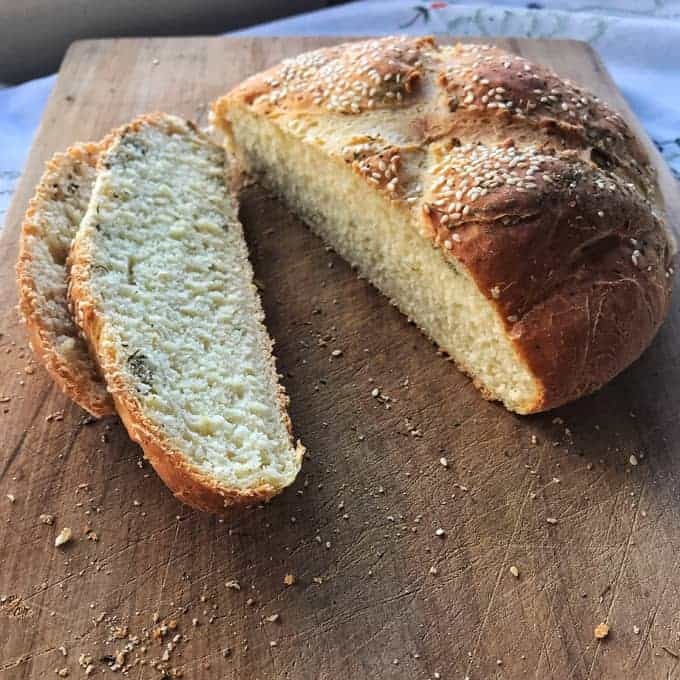 I had some leftover mashed potato in the fridge so thought I would whip up this delicious bread to use it up. 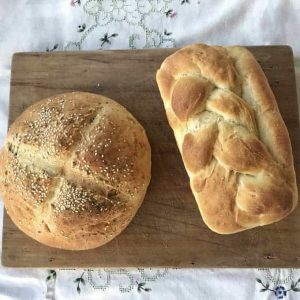 This recipe makes two loaves and uses 2 cups of mashed potato to produce nice fluffy white loaves. I used my KitchenAid mixer with the dough hook attachment and after incorporating all of the flour I set it on a slow knead for 5 minutes. Then I left it in a oiled bowl covered with a tea towel for 30 minutes in a warm place until it had risen in size. 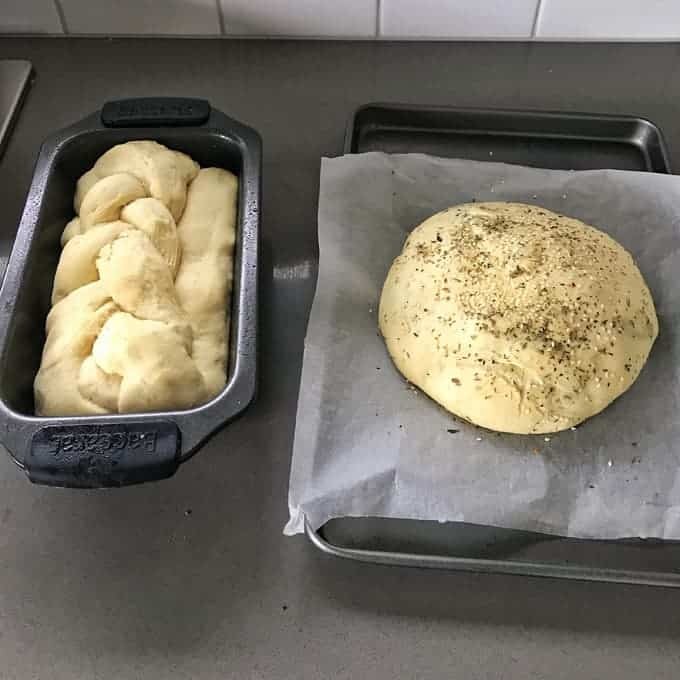 Once divided in two I put one in a oiled loaf tin and made one freeform seasoned with Pepper & Me Whatevs Mum salt and Italian Stallion blend. If you don’t have these and you want to flavour your bread you could add some dried herbs, spices or salts. This mashed potato bread is the perfect companion for my easy Slow cooker chicken soup. 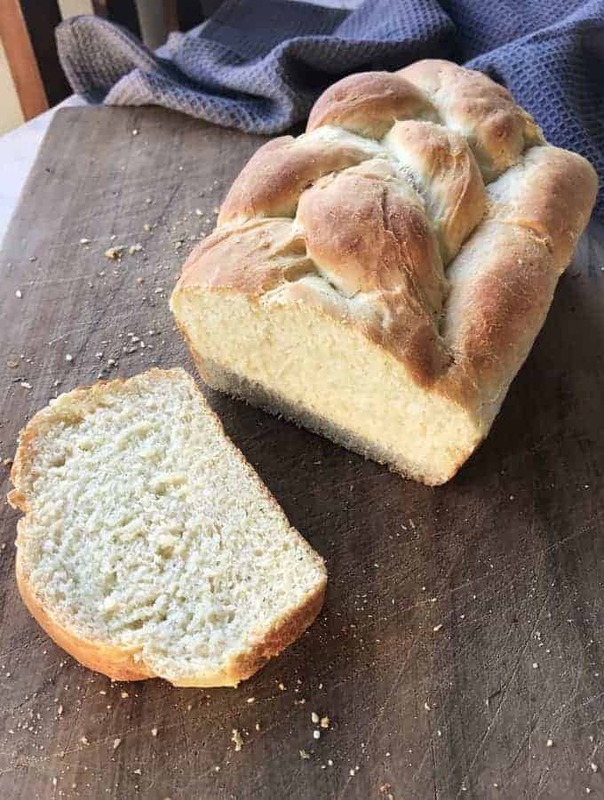 If you have leftover mashed potato this delicious white bread is the perfect way to use it up. Mix together warm water and yeast in a small bowl, add a pinch of sugar help activate the yeast then set aside for 10 minutes. 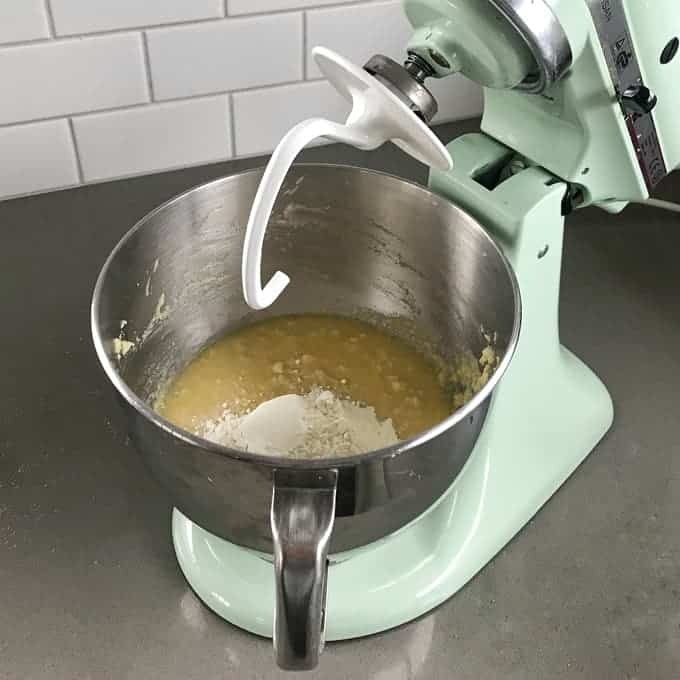 In the bowl of a stand mixer add the boiling water, butter, sugar and salt, stir together until butter has melted. Add the mashed potato and stir wth a fork until it has all broken up. Pour in the yeast mixture and add 3 cups of flour, set the mixer to low with the dough hook attached. Knead until most of the flour is incorporated then add two more cups of flour one at a time. Knead for 5 minutes on low until you have a silky dough, if it is too sticky add more flour and if it is too dry and starting to crack add water one tablespoon at a time. 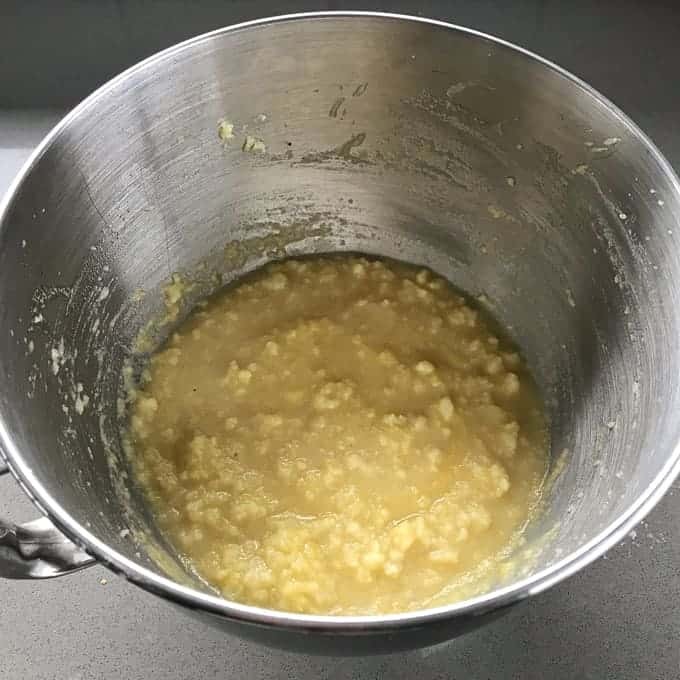 Remove the dough from the mixing bowl and shape into a ball, grease the bowl with cooking spray or butter and return the dough. Let it rise covered in a warm place for 30 minutes. Punch down risen dough and knead a few times on a floured surface, split dough in half. Add dough to an oiled loaf tin or if you want a round loaf shape into a ball and put it onto a lined tray. Set aside to rise again in a warm place until almost doubled in size. If your kitchen is not warm enough you can set your oven to the lowest fanbake setting ( mine was 40.c ) with a bowl of boiling water and put the dough in there to rise. Once the dough has risen cook it in a preheated oven at 180.c fanbake for 45 minutes or until cooked though and golden. Remove from tin once cooked and allow to cool on a baking rack or serve warm with butter.